What if the one thing that could make you happy was a few simple choices away? A successful entrepreneur living in Southern California, Scott Rieckens felt like he had a dream life: A happy marriage, a two-year-old daughter, a membership to a boat club, and a BMW in the driveway. But underneath the surface, Scott was creatively stifled, depressed, and overworked trying to help pay for his family's beach-town lifestyle. Then one day Scott listened to a podcast interview that changed everything. Three months later, he had quit his job, convinced his family to leave their home, and cut their expenses in half. 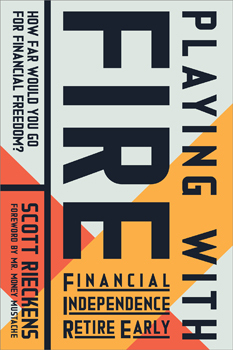 Follow Scott as he devotes everything to F.I.R.E., a sub-culture obsessed with maximizing wealth and happiness. In a time when rates of both consumerism and depression are skyrocketing, Playing with FIRE is one family's journey to acquire the one thing that money can't buy: a simpler - and happier - life.